For future reference, I think land claims are best if done with a top down view of the map. Is there any opposition to my claim? There's a random line of torches in that area, but I don't see any huts or anything like that. I'd like to get started ASAP, so confirmation would be epic. I think I dropped those torches while searching for clay. So, no objections from me. I sure do wish somebody could build a haunted house with secret revolving bookcases and surprise monsters. You'd of course have to go in with wooden swords and no armor or enchanted objects. You have 10 months to finish it for gosh sakes. 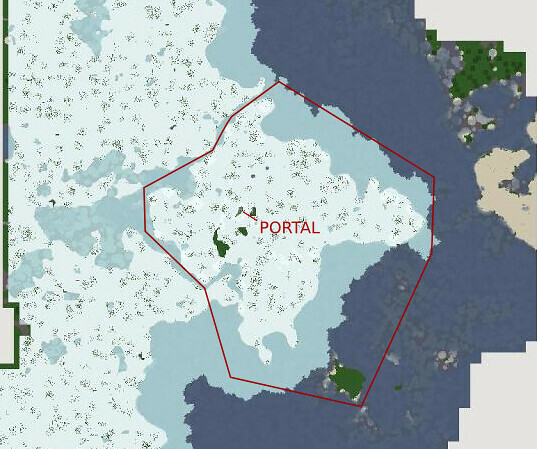 Well now that I've built my portal into the western snow biome I think I had better lay out my land claim there. As you can see it is quite expansive as the rink alone has a 100x100 footprint without outside landscaping. 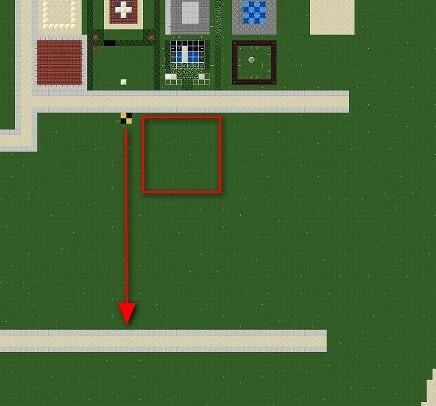 I'll also be adding outbuildings to be part of the complex. I'm also claiming a lot of the periphery on this landmass to control the landscape aesthetic. You guys can create some nice stuff, but I want to maintain control over the area of a mega-project like this. People are welcome to come visit and set up on areas outside of this. I think we may have to setup snow gathering areas as I notice some green areas on those screenshots that are new. Separate portals are easy to install now that the main path has been built. Plots in center of town should be smaller than that, arteggio. What you have asked for is the size of common use buildings; if you want to build something that large, look to the edges of the city, including areas that have not been terraformed yet. Half that size is completely appropriate for in town development. Also to re-iterate: please no exceedingly tall structures. If you want to build a tower, please restrict land claims until *after* everyone else has had a chance to build. As for basements: if you encounter obsidian while digging: no basement (there are other things below town than future subway lines) -- there is also no horizontal digging allowed, and be warned there isn't much unexplored down below. As for walls: I do not believe there should be fences or walls in town. If you want to adjust the terraforming, that's fine, but your chosen project *should* be open to the public and that means no inhibition of access. Edit: and finally, please post overhead view of claimed plot. Last edited by billybobsky : 2011-12-26 at 12:39. The mtn is open as far as I recall (as in almost all land grabs thus far have been limited to the flatlands of swamps). As we discussed in game tonight: There should be time limits on land claims. I will refrain from suggesting any guidelines with the recognition that these things are hard to enforce, but you shouldn't make a land claim that you will not forseeably get to within, say, two weeks to a month. That is, if someone comes along and posts a claim on the land after that time AND starts construction, there's not much you can do about it except look for a new claim. You may want to check with grey (709) in regards to the mountain chain as he has claimed the swampland immediately to the southeast/backside of the range with the potential to be taking down one mountain. 1) If a claim is going to be used on a project for the benefit of all, I think it can stand claimed but unused for a good while (i.e. grey's AN museum complex). 2) If a claim is out in BFE (see: the rink winter claim), I think it stand over a longer timespan than say one closer to town. 'Mm, yes, that is closer than I recalled. If the highlight's fairly accurate, my claim of the central mountain should be safe (along with the new house upon it...). The removal of the east mountain would be fine. I'll wait for grey's call before exploring any more. Just wanted to put that out there while there's nothing over that way (yet). I may need to take down one of the hills depending on orientation, but that's not a huge deal. Brad - when you move structures from one world to the next is the direction fixed, or is it possible to rotate? 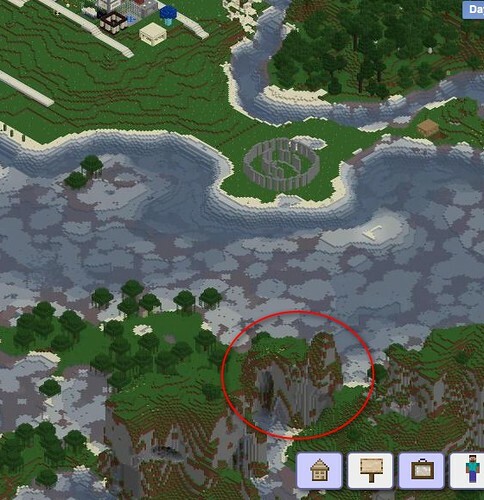 Note that this is just a very general, preliminary claim, and I'll post something more exact once I figure out exactly where the castle will go and what part of the forest beyond it I will need, &c. Just take this as a suggestion not to build something in that general area, particularly on the mountaintop with the flames on top. It's going to be a very large project. Since I also claimed the peninsula, which seems to have become a point of contention for bb, I'll give up the bulk of the peninsula that I so lovingly terraformed. I liked Bryson's idea to make it into a park, although I also think it'd be nice to have a park closer to the heart of the city, too. Thanks again to grey for showing me the fantastic spot. I'm formally requesting this parcel of swampland (about -1120 65 230) for the transplantation of my beloved Artheim castle. Guys, use the overhead view with your claims, too. It's the far right of the "Day" views. Gives us a more specified area. Robo and arteggio's claims are OK by me. Since I've "finished" my distant Fantasma Valley city (go check it out if you haven't already! ), I'm ready to claim a lump of land to do some legitimate mining. 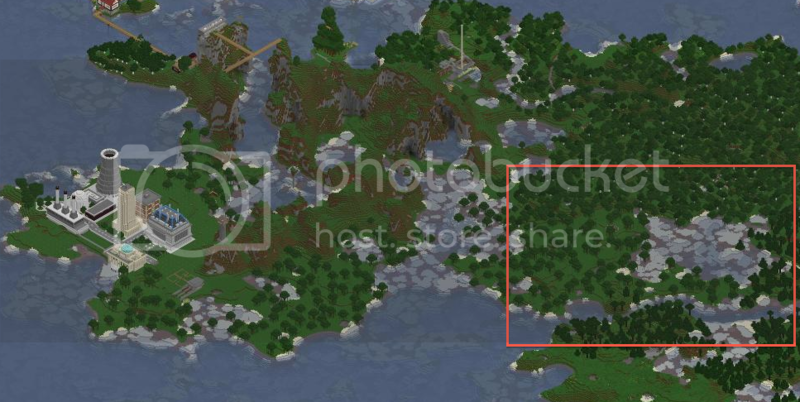 The big mountainous island on the right half of arteggio's pic looks nice and unclaimed. How about it? I was hoping to find a quiet mountain to mine alone mindlessly for a while. If that's too close to you, bb, say so and I'll hunt for another place. Alright, go ahead... it's yours... 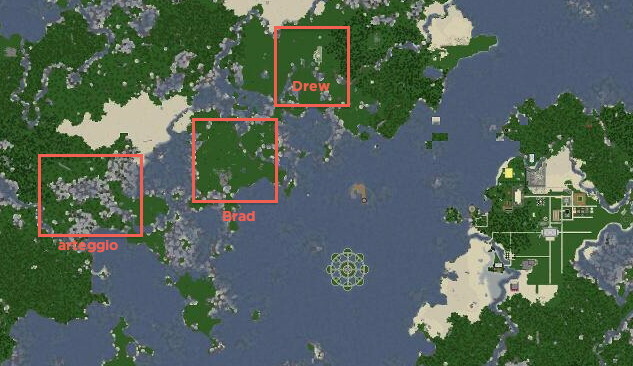 I will talk to drew about the coastline north of the Sky Atoll. If anyone builds on the coastline near me I would prefer that it not be pixel-per-pixel replicas of real world structures or massive "weenie" types of "stunt" projects. Having said that, all I really care about are the mountains directly within sight of my mountain home. If someone built similar structures to mine I might be cool with someone moving relatively close to me. It makes my TNAC plot now 61x81 instead of the 61x61 I originally thought. As for time limits: I feel bad about Long Island. I won't get around to building the AN sign for a good while, so if anyone else has a burning desire to settle Long Island then I could find another site (or just not build it ever.). Or....we could make it a nice community project and all do it together! I like your idea for Long Island... if you want to make it a community thing all the better. When I initially saw the island on the map I thought about making a claim for some Easter Island type thing, but given that I had (have) a few irons in the fire already I thought it greedy. If you'd allow, I may take the backside of the island for some large stone mob totems. They may even make a nice backdrop for the new AN sign. No issues with the TNAC expansion at all. Any objections? I may use more of the surrounding ocean area later, but this is where the first structure is going, at least. Brad I kind of had my eye on that same spot. I've actually already started laying the foundation, but I can zap it to another location if the group votes against it. Did you have immediate plans for the area? Otherwise, I think the "first come first served" doctrine applies. What I'm building needs to be far out in the middle of an ocean, and this was the closest one that fit the bill. Plus, it has the perks of being close to my other big project and begin far away from civilization (since some folks don't like the sight of rampant resource cheating, which this structure and the ones near it will have). 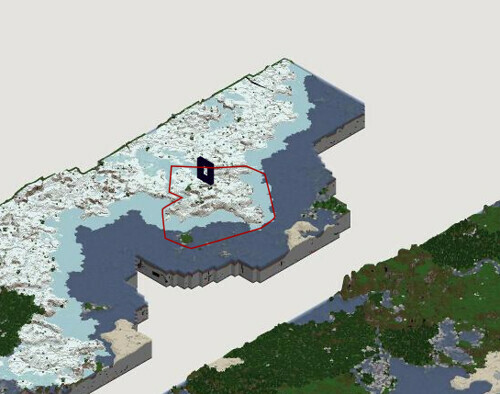 I'd prefer to keep the current location, but I'll propose an alternate to the group: the middle of the ocean between "new spawn" (near Bryson's home) and the future site of the AppleNova sign. Would anyone else prefer (or oppose) I use that location instead of my current one? Keep in mind that I will likely build up more islands once the current structure is complete. On a related note, I'm hereby relinquishing my claim to the larger land mass around my last project of Nurmengard. Neighbors are welcome to build or mine around that area. If bobsky returns, he's free to set up camp on the coast if he's still interested.